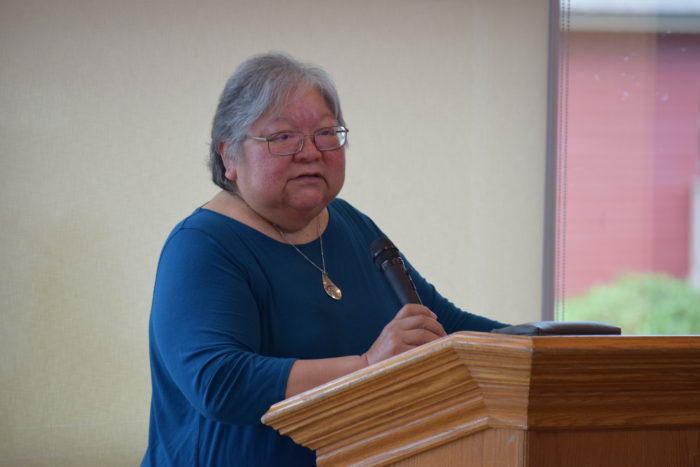 Wanosts’a7 (Dr. Lorna Williams) speaks at VIU in 2018. File photo. A major international conference on Indigenous language revitalization will be held in Victoria this summer. The three-day event is being held to commemorate the fact that the United Nations has declared 2019 to be the international year of Indigenous languages. The HELISET TŦE SḰÁL – ‘Let the Languages Live’ conference will bring together language experts, speakers, learners and advocates from around the world. It will take place from June 24 to 26 at the Victoria Conference Centre. The event is being hosted by the First Peoples’ Cultural Council and the First Peoples’ Cultural Foundation in partnership with the Canadian Commission for UNESCO. A news release from the First Peoples’ Cultural Council said the goal of the gathering is to provide people with practical skills to support language revitalization work. Workshops will focus on training in Indigenous language immersion and documentation, policy and legislation and more. Wanosts’a7 (Dr. Lorna Williams), a Lil’watul language expert from the University of Victoria, said people in B.C. and worldwide are remembering, reclaiming and revitalizing language. “We look forward to welcoming Indigenous peoples to join us (at the conference) to join in teaching the world about the beauty, wisdom and power in our languages,” she said in a statement. More information about the conference can be found at www.fpcflanguageconference.com.